2013 is quickly drawing to a close, and it’s been an especially busy year for the Norman Dott case note cataloguing project. As well as my core role of cataloguing, I’ve also been making sure that the project is well publicised, from participating in University seminars to writing articles and presenting conference papers. The highlight of 2013 for me has to be the extension of project funding given by the Wellcome Trust. After the initial scoping period of the project in Autumn 2012, it became clear that it would not be possible to create a catalogue entry that would be of real value to different groups of researchers inside the original timescale of the project. After submitting a report to the Wellcome Trust, we were delighted that they accepted our proposal to extend the project by nine months to June 2015 and include a contribution from volunteers. This means that we can catalogue all four Dott case note collections with thorough and meaningful descriptions and that the Dott project has become a team effort instead of a solo one. Not only have the four volunteers that have participated in the project this year given their valuable time, but they have also offered fresh perspectives on the case notes and the methods that I’ve devised to catalogue them. Working with volunteers also means that more people know about the aims of the project and why cataloguing case notes in this way is so important (not to mention labour intensive!). Without this volunteer contribution, future researchers would find it near impossible to pinpoint individual patients, neurological conditions and social groups in the forest of case files facing them – so thank you Kirsty, Mahesh, Eleanor and Iain! So what’s to come in 2014? Next summer, the Dott project will become truly international, having been accepted to present a panel at the International Council on Archives conference in Paris in July 2014 along with Wellcome-funded colleagues from the Towards Dolly and Godfrey Thomson cataloguing projects. However, the most exciting update for the new year is that LHSA has been able to offer a paid internship in 2014 focusing on the Dott collections. 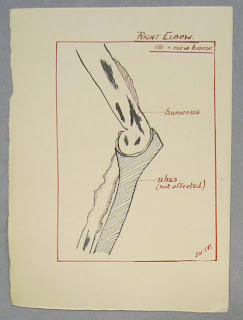 For eight weeks, I’ll be working with the successful candidate to share the work that LHSA has been doing to catalogue case notes to item-level and introduce them to the method that I use, Encoded Archival Description, which is often taught to student archivists in theory, but not always in practice. In the past month, we’ve sadly said goodbye to our current archive intern, Sharon, our research intern, Kirstin, and our conservation intern, Sarah. 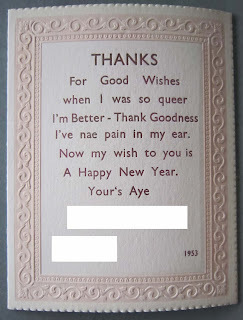 They’ve both made a great contribution to the work of LHSA (as you’ll see from their last blog post! ), and if our 2014 internship starts as well as the 2013 internship programme ended, we’ll begin the new year in style! Merry Christmas, everybody! 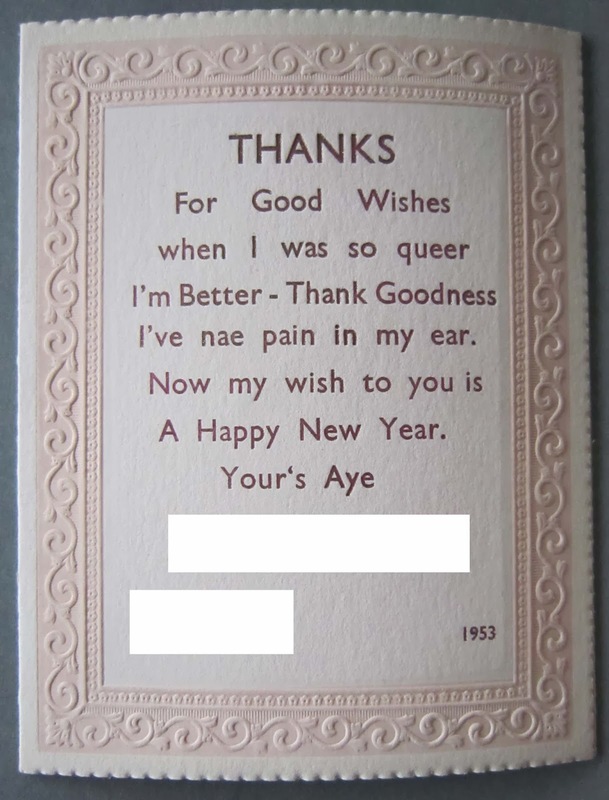 LHB1 CC/24/PR2.1968 - Personalised New Year card from a relieved patient! He’s certainly visited the LHSA offices early this year with confirmation from the Wellcome Trust (WT) of funding for a new cataloguing project. Under the Research Resources funding stream, a grant of £90,497 for ‘RVH v TB: a project to catalogue LHSA’s Royal Victoria Hospital Tuberculosis and Diseases of the Chest Case Notes and Registers (c.1920 – 2000)’ will see the creation of a 29 month Project Archivist post due to begin in autumn 2014. 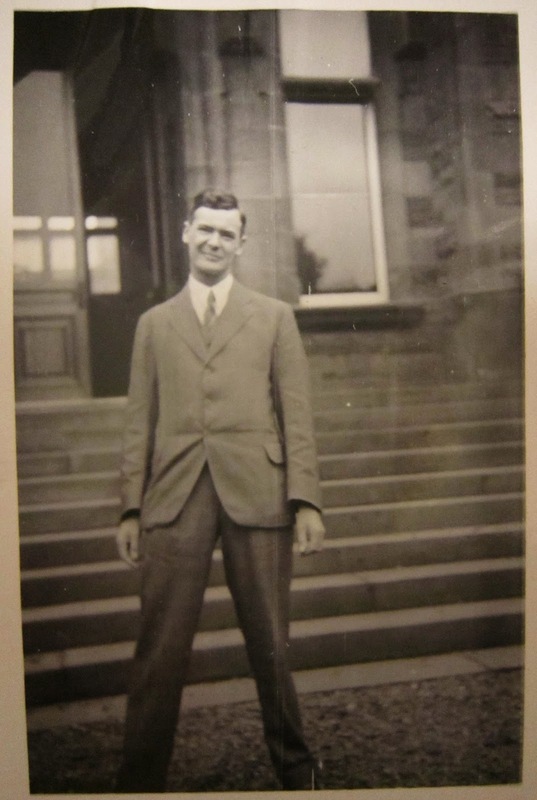 The catalogues will be created in Encoded Archival Description (EAD), building on the methodology developed as part of the current WT-funded Norman Dott case note cataloguing project, enabling dissemination to researchers worldwide. The case note collections relate to the fight against pulmonary TB and Diseases of the Chest in twentieth-century Edinburgh and Lothian, a particularly prevalent and severe threat to public health. TB is one of the long-standing and ubiquitous infectious diseases of the world. 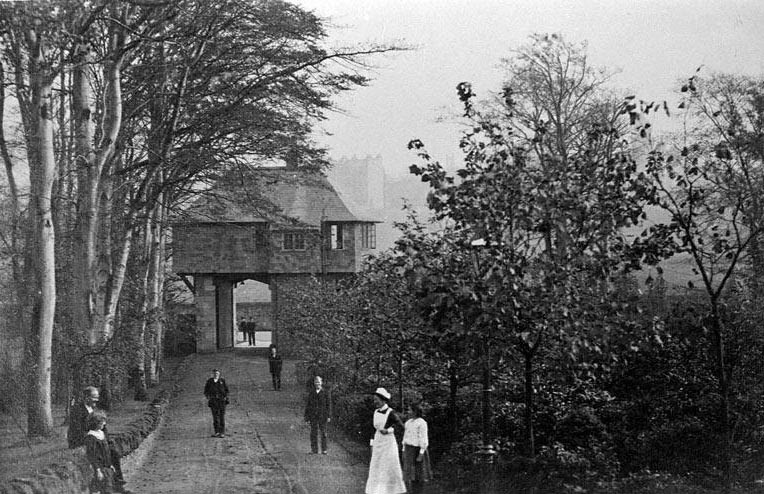 With the first TB dispensary in the world (founded by Dr Robert Philip in 1887 at Bank Street), Edinburgh has a long-established record in attempting to prevent, detect, and treat it. Its resurgence worldwide provides impetus for the interpretation of long runs of patient clinical data, and historical public health policy for its treatment and eradication. This latest funding news comes on top of the award of Wellcome Trust funding for a project to catalogue and conserve LHSA’s UNESCO-awarded HIV/AIDS collections which is due to get underway next month. 2014 promises to be a year with lots of project activity, and we look forward to welcoming new project staff to the LHSA team. 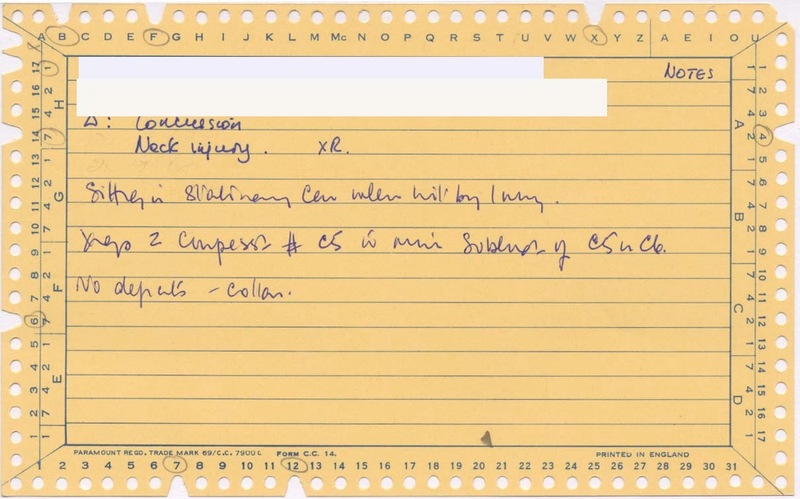 This week there is an update on the long running task to re-order and produce finding aids for all of LHSA’s 1 million plus patient case notes. The good news is that the work, which started in 2007, has now been completed. 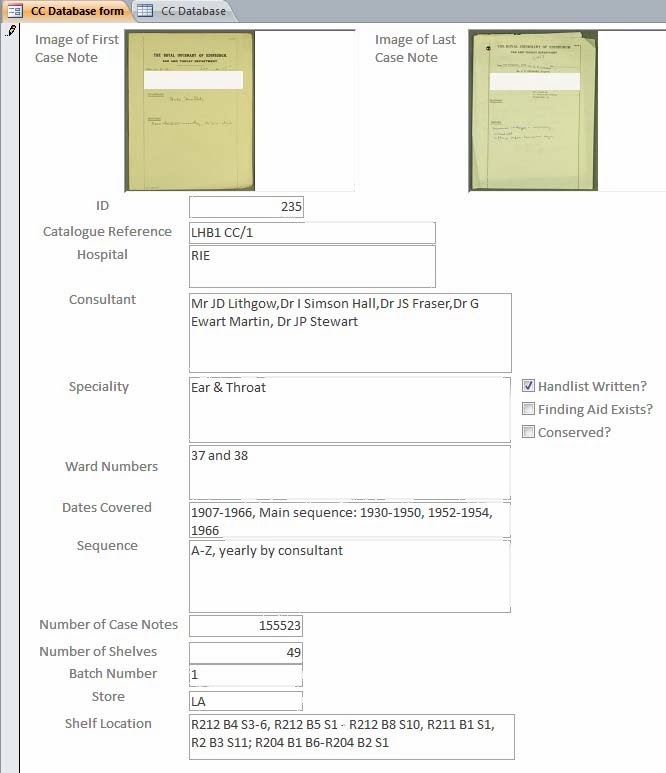 Details of all of the case note collections have been described and entered into a spreadsheet including hospital, consultant, ward, sequence, date range, number of case notes and links with other collections. An identification card has also been written up and placed at the start of each collection on the shelves. 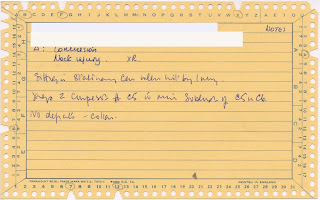 The case note collection data has been entered into an Access database finding aid, with additional information such as locations of relevant index card finding aids and cross-referring them to descriptions on the Finding the Right Clinical Notes webpage http://www.clinicalnotes.ac.uk/. 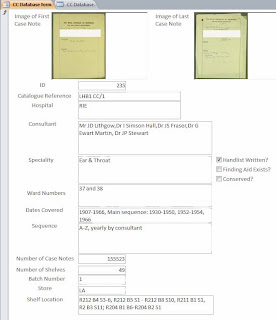 Shown is a collection entry in the form view on the database, which has images of the first and last case notes of collections added so that Archive staff looking for a case note collection in future could identify it visually on the shelf. The spreadsheet and database together are a great resource of information which will help LHSA staff to respond more quickly and successfully to enquiries (for which it has already been put into use), and to plan future project funding bids for cataloguing and conservation. 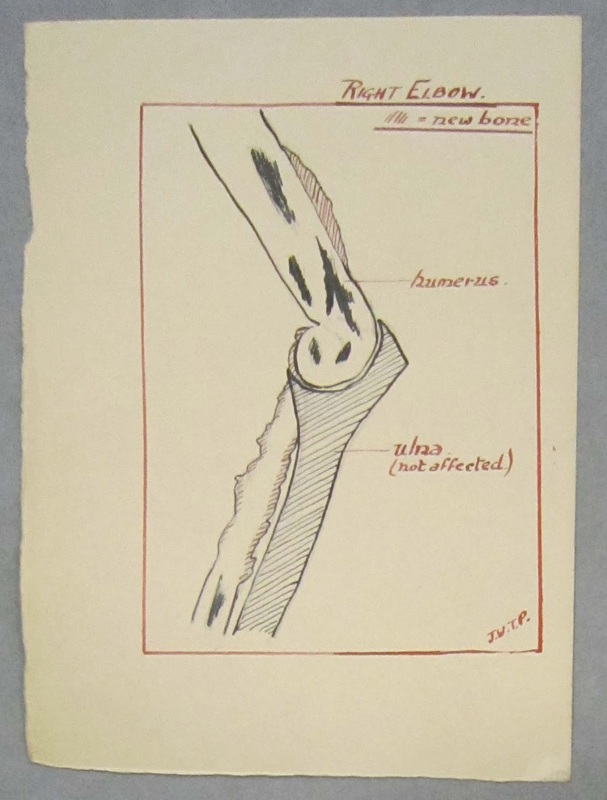 Two images below give examples of some of the variety that can be found in the case note collections: a medical drawing of tuberculosis in an elbow joint from Alexander Miles’ collection, 1919, and a mechanically readable patient card from the Western General Hospital, 1970.